One Box of 20 cartridges: New production, 7.35x51mm Carcano, New production by PCI using new brass cases and loaded with a 128 Grain JSP (Jacketed Soft Point) projectile, for use in the Model 38 Bolt Action rifle. Loaded to SAAMI Specs. Please make sure you know which rifle caliber you need 6.5 Carcano or 7.35 Carcano before ordering, returns can be costly for you. History of 7.35x51 Carcano Cartridge: The 7.35 Carcano cartridge was adopted in 1938 by the Italy Military to replace the 6.5x52mm Carcano cartridge of 1891. 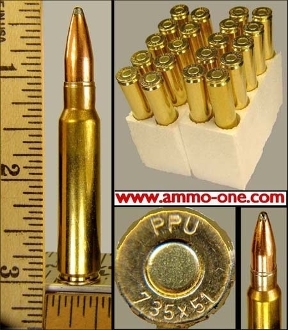 The 7.35mm is basically a 6.5mm Carcano cartridge necked up to 7.35mm diameter projectiles. The cartridge was use by Italian, Russian and Finnish military. The 7.35 was used in a modified Model 91 rifle (1891) and renamed the Model 38 rifle (1938).